NDC Presented the 2017 Robert W. Davenport Community Development Leadership Award to Tracey Nichols, a Cleveland-based leader with a 33-year career that resulted in nearly 900 projects worth $3 Billion that created or retained 34,000 jobs in Northeast Ohio. 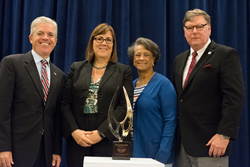 The NDC Academy Awards—held biennially in Washington, D.C.—gave its top prize to Tracey Nichols, who credits her career to attending one of NDC’s training sessions as a newly hired government employee while she was still in college. More than thirty years later, she recently retired as the Economic Development Director of Cleveland as a highly recognized economic development professional, both locally and nationally. At the awards ceremony, Ms. Nichols told the story of how she ended up at an NDC training session almost by accident, but came away from it having learned more in a week than she had in some college coursework. “I decided then to go into economic development,” she told the 350-person crowd at the NDC Academy Awards ceremony, which also honored projects from around the country in four categories: investing in small business, innovating project finance, rebuilding public infrastructure, and building affordable housing. From small businesses to major developments, Ms. Nichols is afforded substantial credit for shepherding Cleveland’s revival since 2008, a challenging time to become the city’s chief economic development director. During her tenure, Downtown Cleveland has been reshaped, with 10,000 more residents calling it home. The redevelopment of the East Bank of the Flats—an entertainment district that had fallen on hard times—has since attracted significant investment, including a new commercial building anchored by Ernst & Young and an Aloft Hotel, as well as many new entertainment venues. Further uptown in University Circle, the city’s Eds and Meds district, the first high-rise apartment complex is under construction, which is adjacent to the Health Tech Corridor, a major biotech initiative championed by Ms. Nichols. Ms. Nichols is now the director of financial services at Project Management Consultants (PMC), a Cleveland-based subsidiary of the law firm Thompson Hine. The Robert W. Davenport Community Development Leadership Award is a biennial award named in honor of retired NDC President Bob Davenport, a nationally recognized community development advocate who had helmed the organization since 1986. Under his leadership, NDC achieved recognition as one of the Nation’s most innovative and respected economic development organizations, credited with introducing leading-edge financing techniques and programs designed to increase the flow of capital into economically underserved communities. The award recognizes individuals who exemplify these goals, above and beyond the work of their peers, standing out as individuals who have accomplished much for those who have needed it most. NDC’s work focuses on HOMES, JOBS, and COMMUNITY. Founded as a national nonprofit in 1969, NDC has worked for over 45 years fulfilling its mission to increase the flow of capital for investment in low-income communities. NDC directs capital to support the preservation and creation of affordable housing, the creation of jobs through training and small business lending and the promotion of livable communities through investment in social infrastructure. NDC’s products and services are deployed for the benefit of our municipal and nonprofit partners in both urban and rural low-income communities throughout the United States. NDC is headquartered in New York City with offices in Washington, DC, Seattle, WA, Cleveland, OH and Cincinnati, OH.